LePage and Fredette feed on populist anger but can't deliver anything for the people. The tea party hit Maine in 2010, sweeping Paul LePage into office along with Ken Fredette, current leader of the House Republican caucus, and a core of conservative legislators who wanted to tear government down to its roots and rebuild it in their image. Now we know how the party ends. We’re not predicting that the kind of political combat they introduced will go away when they go (most of them will be out of office next year as a result of term limits). But it should be clear to everyone where this strain of radical, anti-government populism ends up. A movement that began with optimistic promises of putting tired and corrupt government institutions back to work for the people of Maine has given us institutions that can’t do much of anything. Despite pledging to put “people before politics,” all these lawmakers have delivered is politics for politics’ sake. 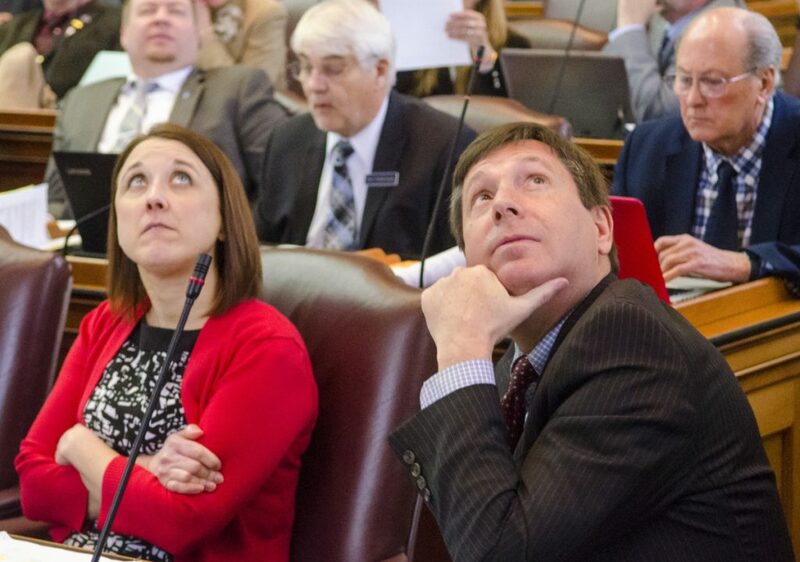 Last week, LePage, Fredette and the others maneuvered to send the Legislature home for the season, leaving work unfinished on more than 100 bills – including some of their own top priorities – in an attempt to grab leverage. Fredette demanded a rollback of the minimum-wage law and elimination of funding for Medicaid expansion as his price for allowing lawmakers to keep working, even though both laws had been approved by the voters in referendum elections. LePage chimed in as well, submitting major bills that would, among other things, abolish the Maine Turnpike Authority, make Maine a right-to-work state and restore the age at which one can buy tobacco to 18 – his personal fixation since the Legislature moved it to 21 over his veto last year. None of those measures passed, of course, but neither did anything else – not even a routine bill that fixes drafting errors in new laws already on the books. As a result, there may not be a road construction bond on the ballot this year; school districts around the state could see a huge drop in state funding instead of the substantial increase they had been promised; and bills that would create new drug treatment beds, shorter waiting lists for services for people with disabilities and higher pay for direct-care workers are all unfunded. Maine’s government is not working, and it’s easy at times like this to blame squabbling between Democrats and Republicans for our problems. But that’s not what’s going on. We have always had partisanship, and until recently, we were always able to find ways for people to work together even when they had fundamental differences. You might not know it, but Democrats and Republicans are cooperating in Augusta even now – except when Gov. LePage and the tea-party cadre of House Republicans impose their version of minority rule on a process that works best through consensus. These are the same people who upended a bipartisan budget deal last summer, forcing the state government into a pointless three-day shutdown. And last week, they used their power to withhold consent on a routine measure to extend the legislative session for five days, which would have given lawmakers time to finish negotiating in good faith. This shouldn’t be confused with normal ideological competition between liberals and conservatives. What is happening in Augusta is intentional obstruction by a minority represented by leaders who think they have cornered the market on righteousness. LePage, Fredette and the others don’t play by the old rules. They don’t trust their opponents, so they don’t feel obliged to behave in a trustworthy way. They blow up deals, they refuse to negotiate and they spring last-minute surprises. They would rather accomplish nothing than something, if accomplishing something would require compromise. Political scientists Steven Levitsky and Daniel Ziblatt describe where this can lead in their book “How Democracies Die.” Democracies need explicit rules that force majorities to share power. But they also need unwritten rules, what the authors call guardrails, that keep the government functioning despite irreconcilable differences between partisans. It’s essential, they say, to uphold a tradition of accepting that the opposing party has a right to exist and will sometimes win. It’s also vital for actors who have the power to stop the majority won’t use it every time they can. Maine’s tea party moment has shown us how little government can get done without the guardrails of mutual respect and self-restraint. Mainers should take a good look at what’s happening in Augusta and decide if it’s not time to try another way.